House Republicans continued their progress on passing a budget that lives within ongoing state revenue at a time when national indicators point to an economic slowdown. By the end of the week, the House will have debated the five budget bills it is responsible to start: Federal Block Grants, Transportation, Infrastructure (RIIF), Administration & Regulation, and Education. Additionally, the House Appropriations Committee is expected to have considered four of the budget bills started by the Senate: Agriculture & Natural Resources, Economic Development, Judicial Branch, & Justice Systems. This will leave two bills yet to begin the process – Health and Human Services and Standings. Both of these bills are to start in the Senate. All of the budget bills moved by the House will be funded within the on-going revenue estimate for FY 2016 of $7.1755 billion. The need to keep on-going state spending within this amount was evident again on Wednesday when the U.S. Commerce Department released figures on the first quarter’s gross domestic product. First quarter GDP for calendar year 2015 slowed to 0.2 percent growth. The Washington Post stated that the national economy “ground nearly to a halt.” The actual growth rate was well shy of the 1.0 percent growth predicted for the quarter and the 2.4 percent growth rate experienced in 2014. The causes for the sudden slowdown are varied. Exports took a significant drop in the first quarter, with the export of goods and services going down 7.2 percent. Part of the blame for this is the stronger dollar, which has made goods for export more expensive in foreign markets. Another issue was the 2015 winter and its severe impact on certain areas of the country. While Iowa’s winter was bearable, the northeastern US was repeatedly hit with massive snowstorms which impacted consumer spending. Construction and manufacturing related to homes were stagnant during the quarter and the number of new hires grew, that growth was almost half of what was experienced in the last quarter of 2014. The fact that Americans continue the trend of reducing their debt load and saving more also impacted GDP growth. The sluggishness of the economy is sending cautionary signals to economists and policymakers across the country. Here in Iowa, the recent discovery of avian influenza in major turkey and chicken flocks has the potential to have a major impact on the ag economy. And state revenue growth for Fiscal Year 2015 still remains below the figure projected by the Revenue Estimating Conference. 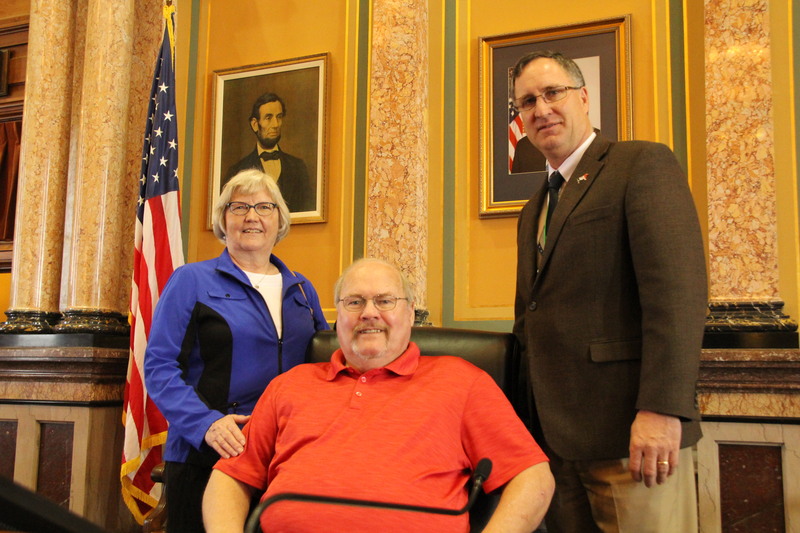 House Republicans’ efforts to pass a budget that spends less than the state will take in shows a commitment to common-sense budgeting practice that Iowans across the state are putting to use in their own homes. On Monday, April 27, 2015, the Iowa Department of Agriculture and Land Stewardship (IDALS) issued a press release that authorities are responding to probable cases of highly pathogenic avian influenza (HPAI) in commercial poultry farms in Osceola, O’Brien and Sioux Counties in Northwest Iowa. State officials have quarantined the premises and if the initial tests are confirmed, all birds on the property will be humanely euthanized to prevent the spread of the disease. Also on Monday, Iowa Agriculture Secretary Northey appeared before the House Appropriations Committee to describe this outbreak and what additional state financial resources are being used by the state/IDALS in this investigation and eradication and clean-up effort. Also discussed was what additional funds might be needed in this effort. Monday’s press release describe generally the location and type of poultry farm involved and what the status is for the specific farm. As of Thursday, there are 17 different farms showing positive for the H5 avian flu with more being found daily. The farms have been located in Northwest and North Central Iowa. IDALS noted that Center for Disease Control (CDC) and Iowa Department of Public Health considers the risk to people from these HPAI H5 infections in wild birds, backyard flocks and commercial poultry, to be low. No human infections with the virus have ever been detected there is no food safety risk for consumers. IDALS is cooperating in partnership with the Iowa Department of Public Health are working directly with poultry workers at the affected facility to ensure proper precautions are being taken. People should avoid contact with sick/dead poultry or wildlife. If contact occurs, wash your hands with soap and water and change clothing before having any contact with healthy domestic poultry and birds. The IDALS press release advised that all bird owners, whether commercial producers or backyard flock owners, should continue to practice good biosecurity, prevent contact between their birds and wild birds, and report sick birds or unusual bird deaths to state/federal officials, either through their state veterinarian at 515-281-5321 or through USDA’s toll-free number at 1-866-536-7593. Information will also be posted to the IDALS’ website at http://www.iowaagriculture.gov/avianinfluenza.asp. I ran a subcommittee on Thursday for a bill dealing with tax credits for farmers. House Study Bill 251 assists crop farmers in reducing soil erosion and sediment loss, managing nutrients, and reducing contaminant loads contributing to surface water. The bill provides for a tax credit agreement between the farmer and the Department of Agriculture. The agreement requires the crop farmer to establish and maintain an environmental practice on the farm land for a set period of time. The environmental practice is agreed upon by the Dept. of Ag and the farmer. The bill limits total tax credits to three million dollars per year. Guidelines are also laid for inspection of the land to ensure the farmer is continuing environmental efforts while receiving the tax credits. While the bill still needs some technical corrections, the bill passed out of subcommittee unanimously with the intent to make those changes in committee. This is another tool in the toolbox to help the nutrient reduction strategy plan to meet its goals of cleaner water. Friday this week marks the 110th day of session and is the last scheduled day. If you’ve seen the news, you know that we will still be here past Friday for the foreseeable future. After Friday, we will lose clerks and other support staff and we will no longer receive per diem for our time in Des Moines. Both Chambers have started to pass budget bills so things are starting to move. If there isn’t agreement on budget bills, it goes to conference committee to work out the differences. After all budgets are passed, the legislature can adjourn for the year. 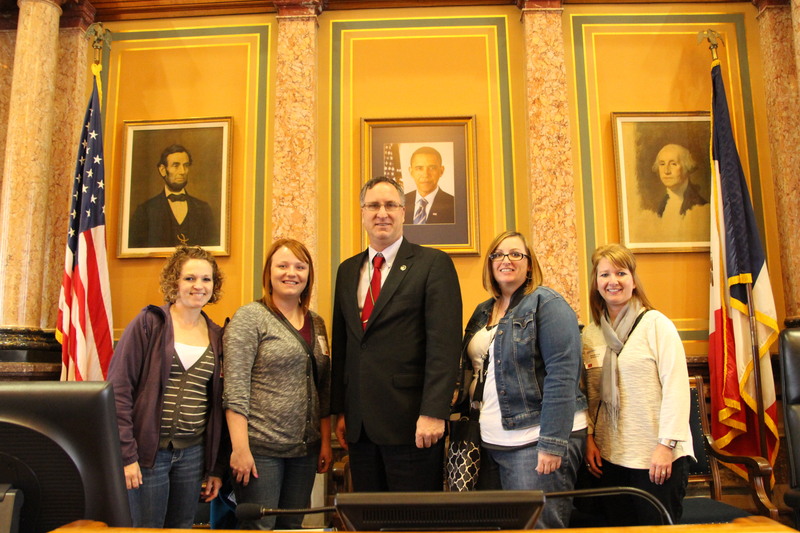 Diane McElmeel, Katie Easterly, Nancy Fahey, Stephanie Bildstein from Anamosa and I in the House Chamber. The group visited the Statehouse to attend ID Action Day on the Hill.